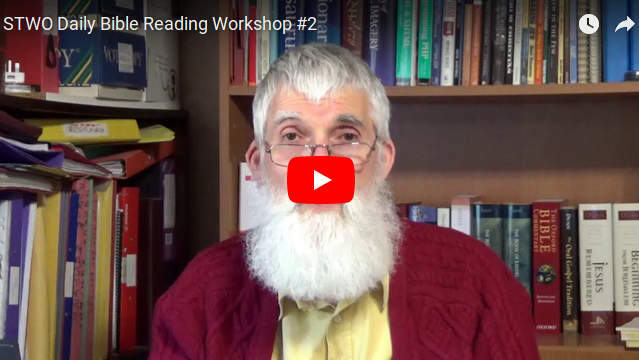 We've just released the second part of Spreading The Word - Online's Daily Bible Reading Worshop today. This is the second of four short video sessions over the next ten days, with plenty of opportunity to comment and engage here and on social media. Do join us by watching the second video (click the image above) and then leave some comments below to let us know what you think. The third session will be released later this week. If you missed the first part, just click on the "Workshop Started" article in the left-hand column and then come back for this one. The start was so on target!! Even though retired, there is always the thought of what the day holds. How good to be reminded of the value of cross referencing. We live in an instant generation where we want everything presented to us on a plate but Scripture cannot be delivered instantly and we live in days when knowing the Word and truth is vital so that we can stand. Thank you for drawing us back to these things. Did you look at WordLive (Scripture Union) which I have followed and is better for being digital. Another fascinating lesson! I'm so thankful to find this type of daily study being developed. I remember reading the Word as a young believer, with a spiritual hunger thirst. I recall my absolute marvel and excitement when I found a verse in the New Testament being confirmed in the Old Testament and visa versa. Yes, I love cross reference of the truth! I really find the different genealogies regarding the inclusion of certain unexpected individuals so fascinating and I so appreciate our Lord not being a Respector of persons. Cross referencing with regards to genealogies, gives me a rich appreciation of the lives and background of the included Bible figures as ordinary people. Thoroughly enjoying these foundational videos. I look forward to the next one, and to the full Bible study! I learned a lot about cross references in this workshop. Even though I have used them daily, I never realized the meaning behind all those genealogy listings. Use to try to avoid reading them because I found myself getting lost trying to keep them straight in my mind. I now know to take a few verses at a time to see the family connections. Thank you for your insight. Absolutely love your teachings! Blessings to you! Interestingly one of the things the Lord put on my heart for our recent tour in Israel, "Seeking God's Heart in the Negev" was the importance of the genealogies. So I went down the route you took and also encouraged the participants to read not study but read as a book) the first 11 chapers of 1 Chronicles just to look out for names and names which were attatched to places that they might recognise. Exciting to see that you are being led this way too.